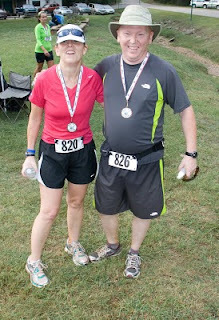 Yes, I did it…I survived the Winslow Half-Marathon, without running a single hill in training. My brother Dave Mows Grass talked me into this—it was to be his first half-marathon, actually his first running race of any sort, and he was willing to let me share in the fun. Thanks to Winslow, I dragged myself out to run four times a week through Houston’s hottest summer on record. 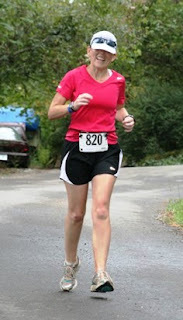 Of course, none of those runs involved any hills, so I knew I was totally unprepared for Winslow. I’d heard from Dave that Arkansas had shared in the summer heat wave that had fried Texas and Oklahoma. I’m sure most runners were hoping for a nice cool day, but I, rather unwisely, wanted a really hot one! I knew that heat and humidity would work to my advantage. If the temperature at the start would have been 70°F, rising to 85°F by 10:30, the results of this race could have been very different. All those Arkansas hill-runners would have been completely disabled by the heat, forced to walk up hills they would have normally sprinted, while I, acclimated to running in a very humid 95-98°F, would have zipped right by them (at least on the downhills), exclaiming, “Wow, what a beautiful day! I love Arkansas weather!” But alas, it was not to be. Driving through Oklahoma the day before the race, the temperature dropped, and dropped, and kept dropping into the 50’s. I realized I had not brought a jacket, or even a long-sleeved T-shirt, with me. So I popped my freezing self into a small-town Wallyworld and splurged on a nice warm OU Sooner shirt. I like it! It rained all the day before, and quite a bit during the drive to Winslow, but cleared up nicely, or so it seemed. Upon arrival, we dutifully obeyed the friendly race volunteer who directed us to park in the high school’s only handicapped space. (As promised, we did not get a ticket.) Winslow is a neat little town, allegedly the highest incorporated point in Arkansas, and occupies an area of 1.9 very steep square miles. Knowing my complete lack of readiness for the hills, I implemented my planned strategy of running down the hills and walking up the steepest parts. Nearly everyone passed me during the first mile, but I checked my watch and knew I shouldn’t try to go any faster. I passed some of them later. After 5 miles or so, I was pretty happy with my 11:30 pace, and knew if I could keep it up, I’d be very happy with my race. I was alone much of the time, since there were only 126 runners, far fewer than any other race I’ve done, but it was a nice friendly sort of solitude. All went pretty well until mile 6 or so, when we encountered a long muddy downhill that was so slippery no one without superhuman coordination could run it. I carefully picked my way down the hill, and ran most of the way to the halfway-point turnaround. Just as I began to climb back up the slick muddy hill, the skies let loose. It poured, and thundered, and we were all soaked, muddy and freezing. I was actually pretty happy I had passed the turnaround when the rain came—it was much less discouraging that way. Fortunately, the rain let up after a mile or so, and except for that one hill, the dirt road was runnable—not terribly slick or muddy. Of course, after poking slowly up and down the big muddy hill, slowing on the other downhills due to iffy footing from the rain, and my flat-trained legs running out of zip, my 11:30 pace was long gone. Though my time expectations had never been high, it had now morphed from a race to a fun run in my mind, and I just couldn’t seem to muster up the motivation to push myself very hard. I looked at the scenery, said hi to the friendly pit bull in the middle of the road, and visited with my neighbors. I ran with someone recovering from an ultra, someone from El Paso trying to run a HM in every state, and with a nice lady named Marj. When I told Marj I was from Houston, she said, “Oh, you must be Dave’s sister—so nice to meet you!” I asked if she was in the kayaking club (all Dave’s other running friends were kayakers). Marj looked very confused and said that no, she had just met Dave during the race. Apparently they had run a few miles together early on, but she has that magic sort of personality that remembers people and their stories and instantly treats them as friends. I had seen Dave shortly before I reached the turnaround—he was probably a half-mile ahead of me then, and looking good. I could tell he was having a great time. I was having fun too, but doing a bunch more walking than I expected. I was still running down all the hills, and bits of the uphills, but it was slow going. I was looking forward to the last mile—I knew it would be a long steep downhill into Winslow. And sure enough, it was glorious fun running down that hill!! I went just as fast as my tired legs would go, and I passed 3 people going down it…they hollered at me to be careful, but it seemed safer to just lean forward and run than to lean back and brake. I pretended I was on a roller coaster and threw my arms into the air. Neat! With a race experience like this, who cares about finish times? Mine was the slowest yet, slower than the Austin half-marathon I completed 8 months after I started running. I thought at the time that Austin had hills—now I know better. Austin hills are nothing compared to Winslow. At least Austin was paved and had some long flat stretches. Dave finished about 12 minutes ahead of me, and I’m sure will beat me by an hour next year, thanks to a bunch of natural talent and hours of trail running on hills. The winner finished in 1:18, blazing fast in my book. The amazing thing is that when we saw him coming back after the turnaround, he was smiling and waving, encouraging us back-of-the-packers with a cheerful “Looking good! Keep it up!”, and appeared to be having a great time. I’ve never seen a race winner do that before—they are usually pushing themselves way too hard to say anything or even notice the rest of us. The second-place guy, quite a bit behind him, seemed to be in a lot more pain. Maybe I should have pushed myself to the point of pain and finished a few minutes faster. Maybe I should have spent my summer getting up at 4:00 a.m. to run up parking garages. Maybe it’s silly to spend a weekend driving across three states and back to do a slow fun run. Or, maybe the exact right thing to do was to concentrate my summer’s time and energy on training for a longer and more difficult endeavor than Winslow (yes, the ever-hanging-over-my-head dissertation). And then maybe the next exact right thing to do was to lay the dissertation proposal aside for a week to share Winslow with my brother. Wow, what a fun race! P.S. I didn’t lay the writing/research completely aside. I am happy to say that my 30-minutes-per-day writing streak is still going—it reached 60 days on the night before the Winslow race! So, the Winslow Run with the Squirrels Half-Marathon is coming up in 5 days. I haven’t run in over a week, and I don’t anticipate finding time to run in the next few days, so I should be ready and rested. Mile 1 of HM: From the elevation profile, it’s a one mile-long hill (UP-hill of course). It appears there may be a slight downhill at the start, probably designed to encourage the participants to begin the race by running. Photos of a crowd of people walking, or better yet, trudging, across the start line may not be ideal publicity for next year’s race. My plan: Run through the start line, pretending it’s a race and pretending I’m a runner, and then walk the rest of the first mile. Why spend valuable energy running up a hill when I still have to do over 12 more miles? Year 1 of PhD: Start the program running, with great enthusiasm, taking 3 classes my first summer and enrolling in another 3 for fall. Then slow to a walk/trudge/crawl, and be obligated to beg one of my professors for an incomplete so I could write my paper over Christmas and still fulfill my residency requirement. Miles 2-6 of HM: These appear to contain rolling hills, which means every uphill stretch has a corresponding downhill stretch (if you’re a glass-half-full type of runner). If you’re a more negative personality, every glorious downhill is followed by a miserable uphill. My plan: Run the down the hills and let my momentum carry me as far up the next hill as possible. Then walk the rest of the way up, trying to convince myself I am participating in a nature hike and not a race. If there are any race-related signs or other paraphernalia, look the other direction so I won’t feel guilty about not running. Years 2-7 of PhD: (Yeah, I know, the year numbers don’t quite match the miles…if you think you can do better, go to grad school and show me!) Try to accumulate momentum during occasional breaks in the teaching and life schedule, and keep that momentum going as long as possible. When momentum dies, try to pretend that it doesn’t matter and that I am just a normal human being going about the normal responsibilities of life. If any reminders of the looming dissertation (which doesn’t yet exist but needs to) appear, hide quickly!! Any activity, from hobbies to housecleaning to sleeping, can serve as an excellent hiding place. 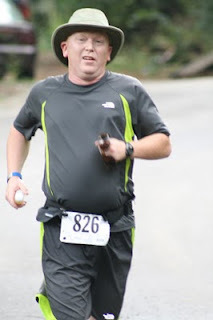 Mile 6-6.5 of HM: Enjoy this long, magnificent downhill and go as fast as I can!! Banish from my mind all thoughts about how it will feel to plod back up it after the turnaround. Years 7-7.4 of PhD: Write like crazy through the entire summer when I’m not teaching. Actually feel like I am getting somewhere and that I just might finish this thing! Mile 6.5-7 of HM: Go back up the exact same hill I ran down during Mile 6-6.5. Enough said. Ugh. Year 7.5-8 of PhD: Attempt to do the same amount of writing I did this summer, but add a full-time teaching job. This is called “writing uphill”. Writing uphill is difficult, but contains occasional moments of fun, or at least novelty. No other experience can quite duplicate the sensations felt upon seeing the sun rise after an entire all-night writing binge. Mile 7.5-12.5 of HM: Same hills as Miles 2-6, run the other direction, with the same strategy. If I missed any beautiful scenery the first time due to my tremendous downhill speed, I can enjoy the same scenes at my leisurely uphill walking pace. Maybe I’ll see some familiar squirrels! Mile 12.5-13.1 of HM: All downhill to the finish!! Years 8-??? of PhD: To be decided. I’m afraid my dissertation journey now diverges from the Winslow Run. I sure hope I don’t have to write up those same hills again!! At last: I defeated the produce! Last fall, I was blessed with the opportunity to join an absolutely wonderful organization: a produce co-op. My friend Becky, who runs it, calls it a coop and calls us all coopers in her messages, but some part of me just cringes at the thought of being in a coop. So I have decided that if I am going to live in a coop, the coop must have a hyphen. Every other Monday (coopday), Becky gathers all the money that her coopers have given her since the previous coopday, and she drives her van to a farmer’s market. I have never gone with her, so I’m not sure exactly what she does, but somehow she uses the power of the cash-filled envelope to negotiate bargains on large boxes of fruits and vegetables. When her produce-filled van returns home, she divides all the produce into boxes, one for each of us. I am curious to know her exact process for doing this—presumably the produce is in boxes when it enters her van (surely it’s not rolling around loose! ), and it is in boxes when we eventually pick it up from her house. But when it enters her van, I expect that each box is full of like things (one box of apples, another box of peppers, etc.). When we get it, the box is full of unlike things (4 apples, 3 peppers, 1 cantaloupe, etc.). In order to refill the boxes properly, wouldn’t she have to empty them? Does she remove all the produce and lay it on the living room floor, and then distribute the apples among the boxes, the same number for each box? If I tried something like that, I would end up finding a 6-month old peach under my couch whenever I eventually vacuumed. It’s not a pleasant thought. Anyway, she must have a system for these details, because we each end up with a giant box, filled to the top with a huge variety of fruits and veggies. For each co-op week, each cooper contributes $20. Being a bit of a data geek, I usually weigh my box as soon as I get home. My box weights have varied between 24 and 29 pounds. What an amazing deal!! Can you go to a store and buy any sort of food for less than $1 a pound?!? Spaghetti noodles, perhaps, but not produce! I am far from being an expert produce shopper, but some of things, such as red and orange bell peppers, are pretty expensive when purchased in a store. Of course, for most of the things, I have no idea whether they are expensive or cheap, because I have never bought them before. My box has contained many fruits/veggies that not only had I never bought before, but I had no clue what they were. For example, I had eaten dried mangos before (thanks to a sweet sister who sent them to me from the Philippines! ), but I had no idea what an actual whole mango looked like. Fortunately, Becky (aware of my status as a produce rookie) pointed out the mango the first time we received one. The mango is a very strange fruit! I still don’t know the proper way to cut it, and I don’t understand the shape of its core or how to tell the core from the yummy mango part, so I just keep cutting slices until I feel my knife encounter something hard and raspy, and then I cut somewhere else. We’ve had plenty of other mystery fruits, including a “cactus fruit” which had a bunch of hard seeds interspersed throughout the sweet parts. That one was more trouble than it was worth, but it was interesting. Kiwis are much nicer. Since last Christmas, one of my recurring non-writing life goals has been to actually use up (or freeze or give away) the entire produce co-op box before any of it rots. Until last co-op, I had failed miserably in my attempts to attain this goal. I kept persisting, partly because I’m stubborn and hard-headed, but mostly because I am a terrible planner and decision-maker. The produce co-op removed the entire burden of grocery decision-making from my shoulders, a wonderful freedom. I am trying to write a dissertation after all, so I need to minimize non-research-related strains on my mental energy. I no longer had to decide what to buy, or to plan what day to do a grocery trip—when the produce co-op arrived, my only food-related goal was to use it up. Simple goals are good. Just as with my writing, even in the midst of my failures, I could still see improvement. As the months went by, a smaller percentage of the produce went bad. Two produce co-ops ago, I really thought I was going to make it. I used all the salad stuff, froze a few things, and persuaded my hubby to eat some apples (Scott has many wonderful strengths, but consuming produce is not one of them). That was the first time my box had contained an eggplant, so I looked up eggplant recipes and really planned to do something with it. Unfortunately, it was final exam time, and life got crazy, and the eggplant defeated me. It got mushy and gross, and I had to throw it away without even cutting it open. I still have no idea what the inside of an eggplant looks like. Finally, the next co-op after the eggplant rotted, I did it!! I actually finished all the produce before it died. (Well, there are a few things that got frozen, and there are still a couple of potatoes left, but they stay good for quite some time—so I still say I won.) Also thanks to the co-op, I enjoyed the satisfaction of another first: I actually used up a bottle of salad dressing! This had never happened before. Every other time I bought salad dressing, the salad dressing purchase coincided with a short burst of salad-buying inspiration. I would make the initial salad, use some dressing, and then put the remaining dressing in the fridge. About a year later, about how long it usually took for salad inspiration to strike again, I would examine the expiration date on the dressing, throw it away, and buy another bottle. Thanks to the produce co-op, I have now polished off two bottles of salad dressing before they expired. One key to my victory was that I actually ate the squash. Many times, the co-op box has contained squash, and I’ve never had any idea what to do with it. I would let it intimidate me into complete paralysis, hiding it in the fridge drawer hoping for inspiration, which of course never came. When the next co-op arrived, I would open the produce drawer, discover that the nice firm squashes were now mushified, throw them away, and replace them with new fresh squashes. Until this recent co-op victory, the only squash I had ever cut up was a long green one that I thought was a cucumber. (I still didn’t know what to do with it, so most of it got thrown away, but at least I cut it up.) I still haven’t cooked a squash, but this time I cut them up and ate them raw—they’re actually pretty good! Of course, I didn’t have much time to enjoy my triumph before the current batch of produce arrived. It came on the very first day of fall semester classes, and so far the only thing I have cut up is the celery. I haven’t frozen, cut, or washed anything else. The fridge is stuffed with cantaloupe, red bell peppers, corn, grapes, strawberries, cucumbers/zucchinis/green squash (not sure which), spinach, apples, peaches, carrots, broccoli, mango, tomatoes, kiwis, and some mysterious round green fruits that feel like plums but are the wrong color. My great victory may be followed by my worst defeat yet. I did give away a couple bananas to a colleague, and that’s about it. But I am ready for battle, armed with a 3-day weekend, my Forever Sharp knife, Ninja blender and salad spinner. Let the duel begin! !